Camels and Monkeys and Priests, Oh My! “‘Take my camel, dear,’ said Aunt Dot, as she climbed down from this animal on her return from High Mass”—has to be one of my favorite opening lines in literature. It’s from The Towers of Trebizond, the 1956 novel by Rose Macaulay. It was assigned reading for one of my courses in college: Books of Western Religion. Popular when it came out, it’s a fairly obscure novel now. As a total church-nerd, however, I love it. The tale focuses on the narrator, Laurie, and her Aunt Dot, who travel with the Anglican priest Father Chantry-Pigg to Turkey. Each has a different motive for the journey: Father Chantry-Pigg to convert the Muslims of Turkey to Anglicanism; Aunt Dot to liberate the women of Turkey by bringing her own brand of Christian freedom; and Laurie to enjoy the journey and the ancient sites. Along the way, they meet with all kinds of people, Billy Graham crusaders, Turkish natives, and other English travelers. The novel is satirical, at times farcical, and a fun read. But Laurie has many reflections on religion throughout (why it was assigned for our course) which are surprisingly relevant for today. She comes from a historically very Anglican family, but has fallen away from religion through the course of a ten-year long adulterous affair. She finds much of religion humorous, including Father Chantry-Pigg, who says Mass every day whether there is anyone else there or not, and refuses to call Istanbul anything but Constantinople. But the scene that stuck in my mind recently was when the trio came into possession of an ape on their journey. Laurie takes great delight in teaching the ape many things, including how to genuflect and cross himself, reflecting that he makes a fairly decent Anglican. Obviously a bit of satire on the part of the author, the ridiculousness of this scene nevertheless makes readers consider what it means to be a worshipping Christian. Is it as simple as doing the right motions at the right times, saying the right words when you are supposed to? Easy enough a monkey could do it? It points to a certain understanding of orthopraxy (or doing the right things) that understands outward actions as the most important part of worship. Get the actions right, at the right time, with the right words, and it was a good worship. You can oppose this with the idea that actions don’t matter at all in what we do—it is only what is in the heart and mind that matter. I take a middle ground between these two extremes. Clearly, a monkey trained to go through the motions is a crazy example meant to evoke a strong reaction. But actions are important. Anyone who has seen me in worship knows that I cross myself and reverence the altar. I raise the lectionary book in the Gospel procession. I think that actions do matter. But what matters most about the actions is what they point to. The actions we take in worship are always methods of helping us make sense of what we are doing—they are symbols that point to something greater than themselves. If we start to worship the symbols instead of that to which they point, we’ve missed the mark. But at the same time, the familiarity of patterns and actions can be a great comfort during times of distress. When my spirit feels unable to worship, my body can lead me in the patterns that are able to bring peace. Eventually, in The Towers of Trebizond, Laurie comes to her own understanding of the role of faith and religion in her life. It is somewhere between the pomposity of Father Chantry-Pigg and her original cynicism. But I have always loved her skepticism, because it led her to dig more deeply into what she valued and to ask why. Rather than blindly accept everything or completely throw away religion all together, Laurie struggled with the hard questions and came out on the other side with a deeper faith. Let’s Go Back to Egypt! My sermon from yesterday focused on Numbers 20:4-9 and John 3:14-21. Check out some of the thoughts and questions below–I’d love your input! I think you might know where I’m going with this. Everything wasn’t better at our old apartment—there was nowhere near enough space for both of us, the carpets were ugly, the kitchen cabinets were tiny, it was a 30 minute drive from Ardmore. Our old apartment was awful! And to be perfectly honest, our new neighbors are only noisy for like, maybe an hour a day—it doesn’t really affect my life. But when faced with the present reality of that noise, the past seems so much rosier than it actually was, and I hop on my own personal “let’s go back to Egypt” committee. We laugh at the Israelites in our first reading a little, because we know they’re being ridiculous. Everything wasn’t better in Egypt—they were slaves! They were miserable, their children were taken from them and killed, and they toiled for long hours for little to no reward. But as much as we might recognize the irony and humor in this story, I think we also can try and see where they’re coming from. They’ve been wandering in the desert for what seems like forever, and all they have to eat is manna. Manna from heaven sounds pretty good, but imagine eating it day in and day out. It must get a little boring. And so they start to yearn for the days in Egypt—they form the very first “Let’s go back to Egypt” committee. I think that every church, every community, every family even, has one of these committees. You know the kind: things used to be so much better than they are now. If only we can go back to the way it used to be. We didn’t used to have to work as hard to get people to join. I liked the old hymnal better. Things were better when so-and-so was in charge of programming, or outreach, or altar guild, or you name it! I’ve certainly been part of that committee sometimes—heck, sometimes I’ve even chaired the committee. I think we can all recognize times when maybe we were the ones on the ‘Let’s go back to Egypt’ committee. When the present is difficult, we tend to view the past with rose-colored glasses on our eyes. But we all know that the past wasn’t perfect. In fact, in the past, we found other things to complain about! We don’t just do it in the church, though, we do it in all areas of our lives: whether it’s wishing we had an old apartment or house, an old job, an old partner, an old friend. When we’re unsatisfied with what’s going on right now, we can yearn for a past that never even was. And what is God’s response to the “Let’s go back to Egypt committee”? Poisonous, biting snakes. That’s what you get when you moan and groan and wish for yesteryear. Remember earlier, when I said there was irony and humor in this story? Yeah, it’s ok to laugh at the snakes. But I like to think of the snakes as a divine wake-up call. As an invitation to stop for a second, and be honest. The snakes cause the people to name their sin and be honest with themselves. When the people do that, they go to Moses and say, “We have sinned by speaking against the Lord and against you.” When they do that, God provides a cure—to look upon a serpent of bronze and live. The bronze serpent was lifted up as a sign of healing and hope, but also as an instrument of truth-telling. Part of being made better, or being healed, was in being honest about what was going wrong in their lives—in this case, a lack of trust in God. In the Gospel reading from John, Jesus compares being lifted up on the cross to that lifting up of the serpent. The cross—an instrument of torture and execution—is a sign of healing and hope, but it is also an instrument of truth-telling. It tells the truth about humanity’s deep need for God’s love, for humanity deep need for God to come into our broken lives and darkness and invite us to live in the light. John says that people love darkness rather than light, that they do not come to the light so that their deeds may not be exposed. In the light is truth, and honesty. When we think about those who love darkness, we often like to look to others. It is often easier to point out and acknowledge the darkness in other people’s lives than our own, but the darkness is there for each of us. It comes in different ways, at different times—but just as we have all been part of the “Let’s go back to Egypt” committee at one point or another, I think most of us know there are times when we would rather stay in the darkness than come into the light. Darkness is the battle with addiction that cuts friends and family out of our lives. It is grudge that we refuse to let go of. It is our turning money and possessions into an idol rather than a blessing. When we gaze upon the cross on which the Son of Man was lifted up—it sheds light on our dark places. It exposes our darkness in the light of truth and love. But hear this: God did not send the Son into the world to condemn the world, but in order that the world might be saved through him. Bringing light to darkness is not for the purposes of judgment, but for bringing life and healing. It is out of love that the light comes into the world. God loves the whole world so much, including those of us who have darkness in our lives. It would be a pretty small list otherwise. Just as those pesky snakes are a wake-up call, we have the wake-up call of the cross, calling us to turn from our darkness and live in the light. Just a final thought about the snakes—you notice they don’t go away. They continue to bit the people. We can’t expect our dark places to miraculously disappear, either. We will continue to struggle with those things, the things that are personal to each of us. The cross doesn’t make sadness or pain go away—but it does say that it is not the end; that because of God’s love—the love that understands suffering and pain—there is also life and light and healing. Amen. The idea for this sermon came when I was laughing at how ridiculous the first reading was. I couldn’t see myself ever using it in a sermon, so I decided to challenge myself. Once I started thinking, the Israelites’ actions didn’t seem nearly as crazy, and in fact, they reminded of things that happen all the time. When have you felt like you’ve been on the “Let’s go back to Egypt” committee? Feel free to share in the comments–it could be something church related, or maybe a time from your own life. Did you know that yesterday was International Women’s Day? It’s a day that’s been observed since the early 1900s, with demands for voting rights, property rights, and public recognition. It’s changed a lot since then, but if you’re interested, check out their website: internationalwomensday.com. Since it fell on a Sunday this year, I started thinking about women and the church—how have we progressed? Where are we still falling short? I recently started reading a book titled 50 Women Every Christian Should Know. It’s not a long book; each women gets about five or six pages dedicated to her whole life. It’s not a book that’s meant to be an in-depth study of any of the fifty women, but an overview, a snippet to entice you to learn more. There’s a lot in there: from Catherine of Sienna, to Harriet Tubman, to Madeleine L’Engle. But one of my favorites is Julian of Norwich. Julian was a mystic, who lived in the fourteenth century. She was an anchoress, which means she lived in a small cell attached to a local church, spending her days in prayer and contemplation. Julian had a near death experience, during which she received seven “showings” or visions of Christ’s crucifixion. She recorded these in her manuscript “Revelations of Divine Love.” She saw in her revelations that God deeply loved the world, and wanted to show compassion and mercy. Perhaps appropriate to International Women’s Day, she also spoke about God as a mother—something that was controversial for her time. Beyond this, not much more is known about Julian. We don’t even really know her name—she is called Julian because her cell was attached to the church of St. Julian. She lived in a time of great turmoil and death; the plague was sweeping through England, and the town of Norwich lost as much as one-third of its population. Yet, Julian emphasized the enduring love and mercy of God. Maybe I like Julian because so little is known of her. She is more than just herself to me sometimes: she is every unnamed woman of faith. Some of the other women in the book were queens or political leaders, but Julian occupied no such special position. She is an example to those of us who, like her, do not hold any special position. Whose names may not be remembered—but whose life of faith was important to those around her, and made a difference. When I think of Julian, sometimes I think of all the women in my own life whose names are not known by many, but who passed down their faith to me: my grandmother who never missed a service, my mother who taught me the parts of the liturgy, my pastor growing up who taught me that women were meant to be leaders in the church. They’ll never be written about in books, but their faith has been so important to me. When I was thinking about this post, I asked everyone who was in the office at the time, “Who is your favorite woman from the Bible?” I got a few answers: Rachel, Mary, Sarah. Did you know that there are over a hundred named women in the Bible? That’s not even considering the countless women without names. Two of my favorites are Esther, who used all her abilities to save her people, and the woman at the well, who challenged Jesus and joined him in conversation. Who are yours? What women have affected your life of faith—from the Bible, from history, from your own life? Feel free to share in the comments—I’d love to hear about them! I am now living in a house divided. No, it’s not a political disagreement; it’s not a matter of seat-up or seat-down; it’s not even that Tim supports New England teams, while I am a born and raised Philly fan. No, none of those things have ever made us stare at each other with such disbelief as “The Dress.” You know which one I’m talking about. The one that blew up the internet last Friday. The one that is clearly white and gold, even if my husband for some unknown reason believes it is blue and black. I first saw a few friends post about the dress on Facebook, and I couldn’t believe that there was any controversy. I turned to Tim, showing him my phone, and planning to laugh at the craziness of other people. “Do you believe some people think this dress is blue and black?” I asked. He looked a little bewildered, and said, “What colors would it be?” I couldn’t believe it! I knew that people saw the dress differently—that was the whole point of its going viral—but I had assumed that Tim would see things the way I did. The issue was investigated and explained. The picture, taken in poor lighting, caused some people’s eyes to compensate and essentially apply a filter to the image. Those are the people who saw the dress and white and gold. Those who took the image as is saw blue and black. For the record, it actually is blue and black (even though I still can’t see it). There was a lot of fast research done through online polls which found that younger people tended to see white and gold, and those who wore glasses saw blue and black more frequently. And all this in a day and a half. It was a crazy story that took social media by storm, and it is now mostly forgotten as we move on to something else. But it brought up a very important point about how much perceptions matter. About realizing that someone else has a different reality than you do. That was the hardest part for me. Tim and I were looking at the exact same image, on the exact same screen, and saw two completely different things. When it’s a picture of dress, in a tweet from someone we don’t know, it’s easy to shake your head and say, “that’s weird,” and move on. But what about when it’s more than a dress? What about when how we perceive the world has profound impacts on our lives? I see the world through a certain lens: I grew up with a suburban middle-class, intact family. I am white, and a woman. I am petite. I grew up in church. My parents were actively involved in my education. I attended a small liberal arts college, and then received a master’s degree. Often we remain unaware of the different lenses that can change the way we perceive reality. What if one of those things were different? For instance, what if I grew up in a blended family, with step-parents and step-siblings? How would I view the world differently? What if I was black, or Latina? Would I still view the presence of police officers as a comfort, instead of a threat? What if I was a man? Would I feel more comfortable walking to my car late at night? You get the point—the options are endless. Of course, there’s absolutely nothing wrong with my first list. It is who I am, and all those circumstances have been a part of making me who I am today. I don’t have to apologize for any of them. But I do have to be aware that they all affect how I see the world, and view my reality. And I have to realize that other people have different realities—and their realities are not wrong because they are not the same as mine. In other words, when someone does something that makes very little sense to you, or says something that seems to come out of left field, take the time to try and see where they’re coming from. 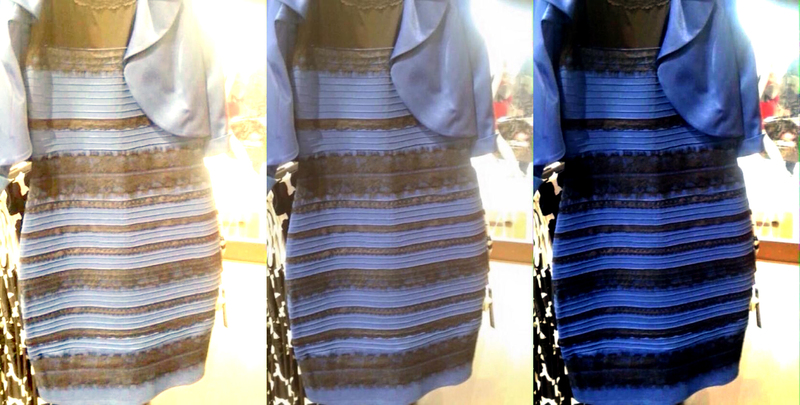 As silly as “The Dress” may be, it can teach us all an important lesson about perspective. Rather than assuming that everyone sees things the way we do, consider that other people’s realities might be a little bit different. Even if the dress was white and gold.